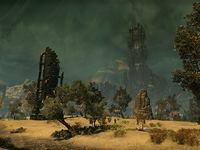 This article is about Sotha Sil's realm. For the Clockwork City DLC pack, see Clockwork City (DLC). Clockwork City is a mechanical realm created by Sotha Sil, one of the living gods of Morrowind. It supposedly exists "outside space and time", represented in Tamriel as a miniature realm within a globe about the size of a large crate, requiring an individual to be magically shrunk to enter. The globe is located in a vault in the Dwemer ruin of Bamz-Amschend, deep beneath the Tribunal Temple in Mournhold. The location serves as the setting of the Clockwork City DLC, although some parts of the city can also be visited in two quests available in the Morrowind chapter of ESO; the Halls of Fabrication and the Clockwork City Vault. The Astronomer's Apprentice: Restore the corrupted memory stars inside the Mnemonic Planisphere. The Broken Brassilisk: Return an inactive brassilisk to its owner. Cogs of Fate: Help a young man prove others that fate can be changed. The Halls of Regulation: Help repair a malfunctioning water treatment facility. A Matter of Tenderness: Brengolin needs your help restocking his meat stores. The Merchant's Heirloom: Return an ancient family heirloom sword. Most Complicated Machine: Help Sovor Saryoni find a cure for his ailment. Tasty Tongue Varnish: Procure some exquisite liqueur for Brengolin. The Registrar's Request: Collect and return sequence plaques to the Clockwork Registrar. Tarnished Truffles: Assist a cook aspiring to improve the limited cuisine of the Slag Town. The Oscillating Son: Find Associate Zanon's mentor for evaluating the Precursor. Rounds two and four of the Maelstrom Arena are themed after Clockwork City. As a mechanical realm, there are no natural resources of wood, cloth or herbs in the zone. These resources drop from respectively Scrap Wood, Torn Cloth, and Herbalist's Satchel nodes. This page was last modified on 12 May 2018, at 23:37.